Verizon Wireless announced on Wednesday morning that it will offer Samsung's Galaxy Tab 2 7.0 with support for its 4G LTE network on August 17th. The device will cost $349.99 and requires a subscription to one of Verizon Wireless' data plans. The Galaxy Tab 2 7.0 is equipped with Android 4.0 Ice Cream Sandwich, a 3.2-megapixel camera, a VGA front-facing camera for video chat, a 1.2GHz dual-core processor, 8GB of storage, support for up to 64GB of storage using a microSD card and Bluetooth 4.0. It also offers several of Samsung's "SAFE" enterprise-friendly features including Microsoft Exchange ActiveSync support, VPN and MDM support and on device encryption. Most people would be better served with the Nexus 7, which offers more powerful hardware (but lacks a rear-camera) and costs just $200 without a contract. However, if you're a Verizon customer and want a travel-friendly 7-inch tab with a blazing fast LTE connection, then the Galaxy Tab 2 7.0 could be right up your alley. BASKING RIDGE, N.J., and DALLAS – Verizon Wireless and Samsung Telecommunications America (Samsung Mobile) today announced the latest addition to the Samsung Galaxy Tab portfolio, the Samsung Galaxy Tab® 2 (7.0), available beginning Aug. 17 in Verizon Wireless Communications Stores and online at www.verizonwireless.com. 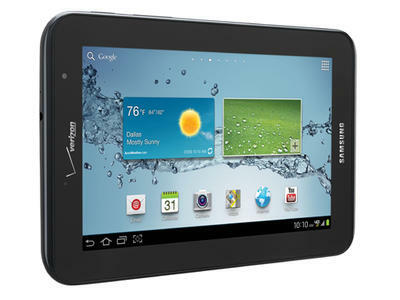 Galaxy Tab 2 customers will have access to the Verizon Wireless 4G LTE network which covers more than 75 percent of the U.S. population and will soon be available in more than 400 markets nationwide. The Samsung Galaxy Tab 2 (7.0) features power and portability with its 4G LTE connectivity and 7-inch display making mobile entertainment easy. The Galaxy Tab 2 runs Android™ 4.0 Ice Cream Sandwich, and comes loaded with multimedia-rich apps like Netflix and Samsung's Media Hub for watching movies and TV shows while on the go or on the couch. Customers can also take advantage of the compact design and use the Amazon Kindle app to keep their favorite books with them at all times. The Peel Smart Remote app turns the Galaxy Tab 2 into a universal remote, helping customers easily find their favorite shows, while eliminating the need for multiple remote controls. The Galaxy Tab 2 is also a SAFE™ (Samsung Approved For Enterprise) device featuring on-device AES-256 bit encryption, enhanced support for Microsoft® Exchange ActiveSync®, and support for industry-leading Virtual Private Network (VPN) and Mobile Device Management (MDM) solutions. Additionally, the Galaxy Tab 2 can maximize productivity with the Polaris® Office application to easily create and edit documents. The app is optimized for tablets and has support for various file types like Microsoft Word, Excel®, PowerPoint®, Adobe® PDF, Zip files and more.